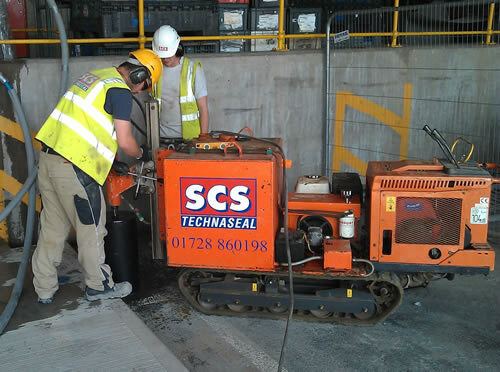 The diamond drilling division of Sealant & Construction Services is a knowledgeable and experienced team, specialising in precision concrete drilling utilising the very best drilling equipment available. Our operatives undergo the CITB Health and Safety Awareness test, are CSCS registered, and trained in drilling and sawing under the NVQ scheme. We carry a comprehensive stock of diamond tipped drill bits and can obtain virtually any diamond product on a next day service. Our diamond drilling equipment ranges from small electric motors up to high powered hydraulic motors for any hole size required on your project. Diamond drilling through mass and reinforced concrete walls, floors and foundations to any depth. 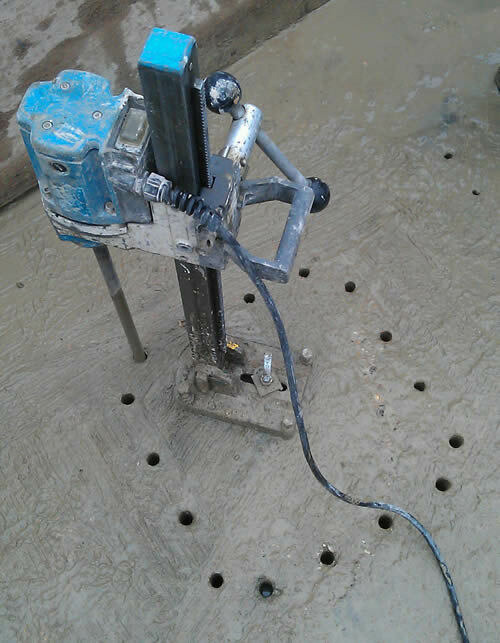 Hand held diamond drilling for masonry where fixing is not possible, wet or dry cutting. Hydraulic diamond drilling for inverted holes, large diameter holes and underwater applications. Dry drilling available where required. Full water control and/or slurry containment and re-cycling systems available for wet drilling in finished / sensitive areas. Low noise and vibration free drilling. 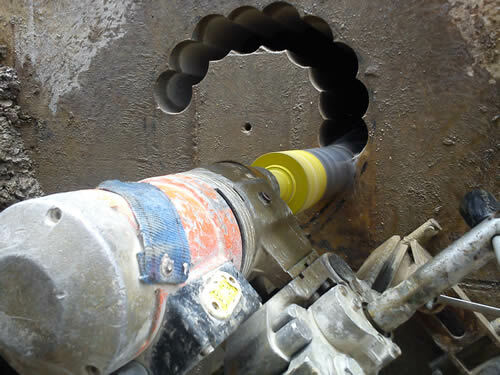 Stitch drilling is a method of drilling a series of smaller holes next to each other to form a larger hole or opening, where other methods of cutting are not suitable and can be horizontal, vertical, angled or inverted, it also has no restrictions on the depth that can be drilled. SCS designed and built the self-contained, self-propelled "Tracked Driller" when we secured a contract to drill a large number of 350mmØ holes for removable bollards on roads at RAF Lakenheath. Its creation has meant we have been able to drill holes from 18mmØ up to 600mmØ in places where trailer rigs that already exist on the market would not be suitable. The tracked driller is extremely versatile and having tracks means it can be driven over the roughest terrain to access the work area where a traditional trailer rig would not. 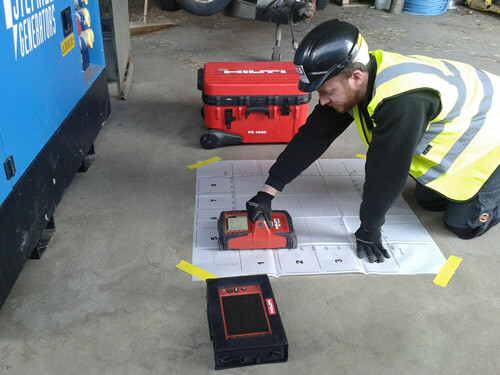 Using the Hilti PS 1000 X-Scan system we can detect reinforcing bars, pre and post-tensioned tendons, metal pipes, plastic pipes, electric cables and glass-fibre cables in minutes – even over large concrete areas. Equipped with three radar antennas, the PS 1000 scanner finds concealed objects at depths of up to 300mm. Scan results are immediately verified and presented on the X-Scan display. The data can then be transferred via software which is loaded on to a PC for further evaluation and analysis. Thanks to its quick set up, ease of operation and easily interpretable 2D and 3D images of concealed objects, the Hilti PS 1000 X-Scan system takes non-destructive structural inspection into a new era. We also use the PS38 Ferrodetector for smaller applications to locate reinforcement in concrete as well as copper and aluminium pipes in concrete or brickwork walls. It also measures the depth of concrete cover over rebars with high accuracy.